Have you ever heard of qigong? It is the new trend that has actually been around for ages in China. Qigong (pronounced CHEE-kung) translates to “life energy”. It is similar to yoga and taught at many yoga studios. The focus is that you sync your movements with your breath to get energy flowing through your body and heighten awareness within yourself and outside yourself. It is kind of a combination of tai chi, yoga and meditation all in one powerful practice. How is it different than yoga or tai chi? Qigong is very graceful and dance-like. Tai chi is actually a martial art and qigong is easier and focuses on healing. It is very good for stress and anxiety. Experts say that it is easier than yoga, tai chi and meditation depending on your ability levels! But how exactly does it help with stress and anxiety levels? Qigong is very similar to meditation and incorporates movement so it has the power to actually reduce inflammation in your body and change your DNA. How cool is that? It helps to put you in the present moment and increase mindfulness, which can lead to less stress and anxiety. It can also help you increase your focus, increase flexibility and heal some health issues. 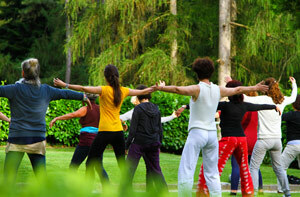 Experts say that anyone can benefit from trying qigong, however you must give it some practice. It may not be easy right away, especially if you are used to more strenuous workouts or have trouble doing things slowly. But stick with it and you’ll start to see amazing benefits! Check out a local yoga or tai chi studio to see if they offer qigong or look up a practice online to start out at home if you are curious. Have you ever heard of qigong? Have you ever tried it? Would you ever try it? Share with us your thoughts!